I’m so excited to share this post with you all. 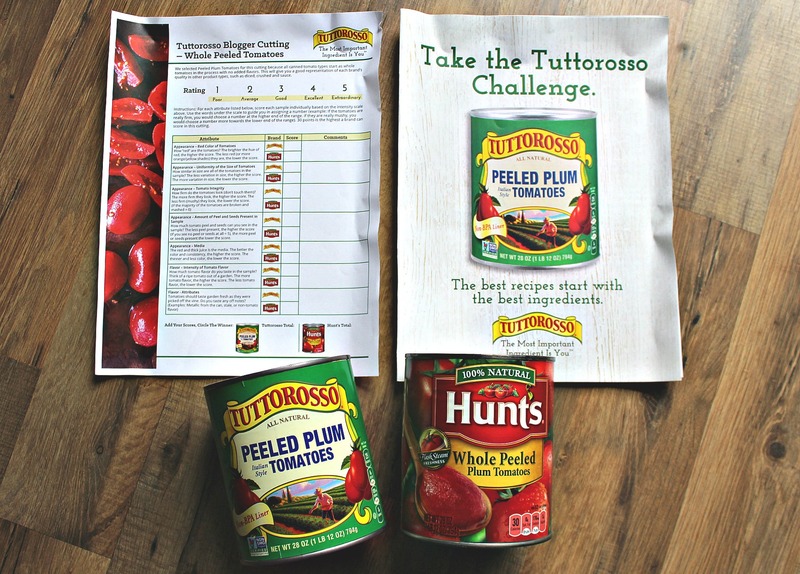 I had so much fun teaming up with Tuttorosso to take the Tuttorosso challenge. 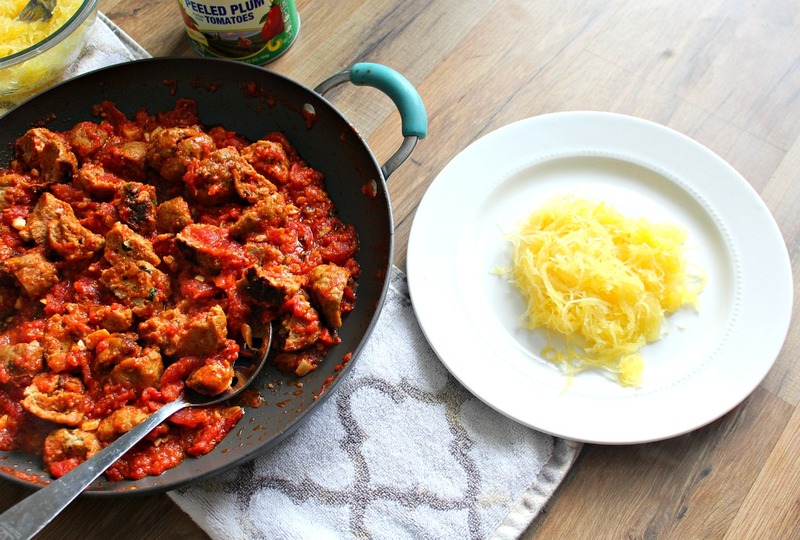 I also had the chance to create a delicious and healthy recipe using the winning tomatoes! Tomatoes used to be just tomatoes to me, but after this challenge, I’ll never look at tomatoes the same again! I think brand comparing is officially my new favorite hobby. This challenge taught me so much about tomatoes in so little time. It makes sense to me know why some people make better sauce than others. 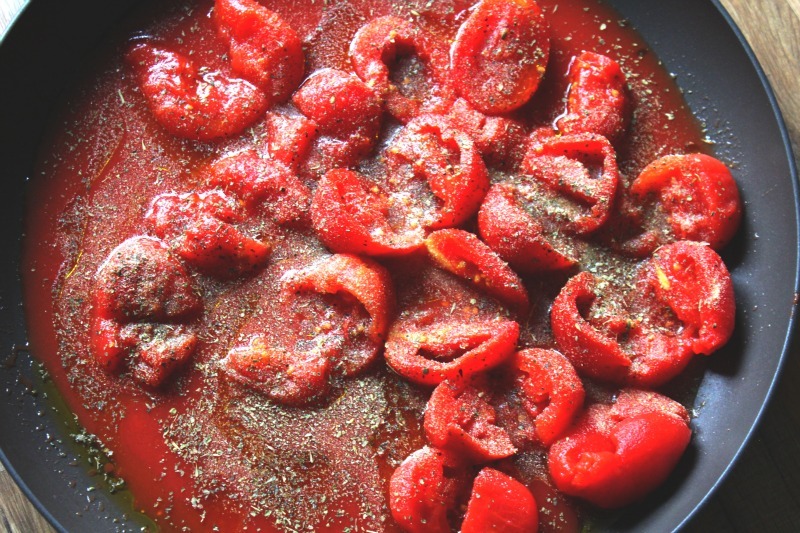 The seasonings play a huge role in great sauce, but the tomatoes play a bigger role. Now I know what to look out for when using canned tomatoes. 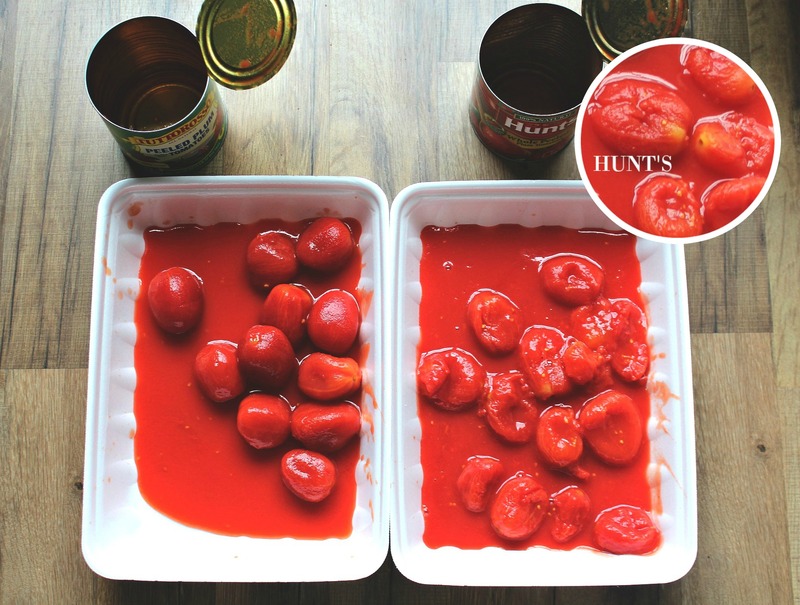 Today I am comparing Tuttorosso tomatoes and Hunt’s tomatoes. My camera tends to make things look brighter, so I’m going off of my notes. The Tuttorosso tomatoes had a richer red and the Hunt’s tomatoes had tints of orange on them. The less the red (or more orange/yellow shades) they are, the less ripened they are. You want all the tomatoes to look pretty equal in size. The Tuttorosso tomatoes were pretty dead even and the Hunt’s tomatoes were small and big. The Hunt’s tomatoes were also flat and runny. You know a tomato is good when it is firm. You should be able to tell how firm they are by just looking at them. 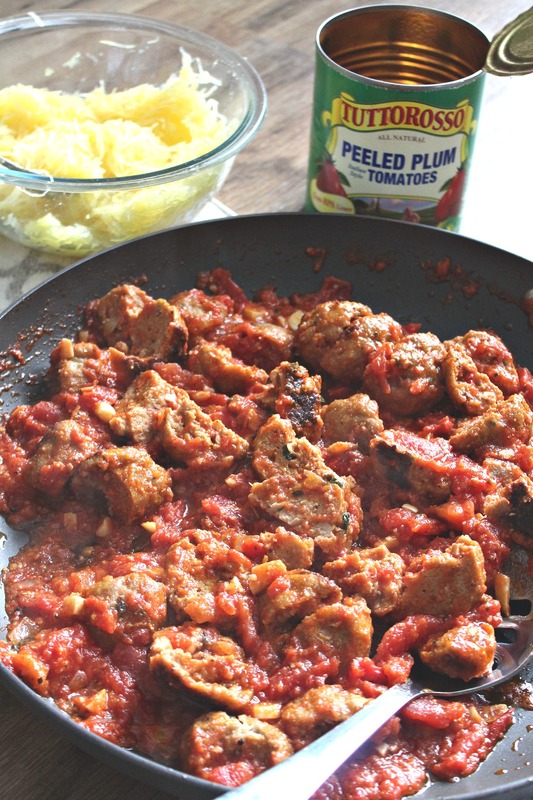 You don’t want a can with mushy tomatoes. The Tuttorosso tomatoes were super firm and the Hunt’s were all damaged and mushed. It looked like I Love Lucy stomped all over them. There were zero visible seeds in the Tuttorosso media (liquid) and several seeds in the Hunt’s can due to the broken tomatoes. They both did pretty well with the peel in my cans. I couldn’t find any. The thicker the media (juice/liquid) the better! Tuttorosso took longer to pour because it was thicker and the Hunt’s was a bit watery. Once I sliced open the tomatoes, the Hunt’s had tons of water liquid ooze over to the other tomato. The Hunt’s juice also ran all the way to the corners of the container and the Tuttorosso didn’t reach the end (see picture 1 before I spread them out) . This is the fun part! I love the taste test. You want a tomato to be flavorful and taste garden fresh. The Hunt’s tasted a lot like the can and a bit watery. 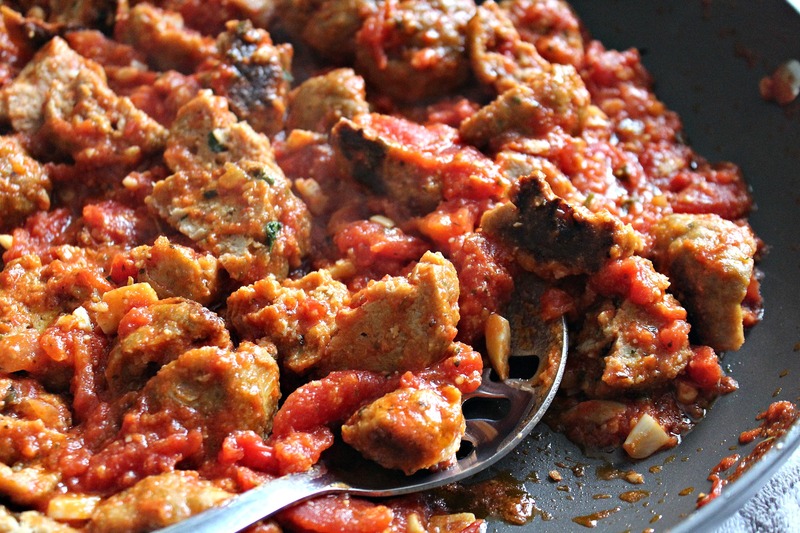 The Tuttorosso tomato was super flavorful with a firm texture. I didn’t like the mushy texture of the Hunt’s tomato. The first time I had ever heard of Tuttorosso tomatoes was when Mr. Ralph had us run to the store to pick him up some tomatoes for his sauce. He specifically said “Tuttorosso”, because they play a huge role in making his sauce taste great. 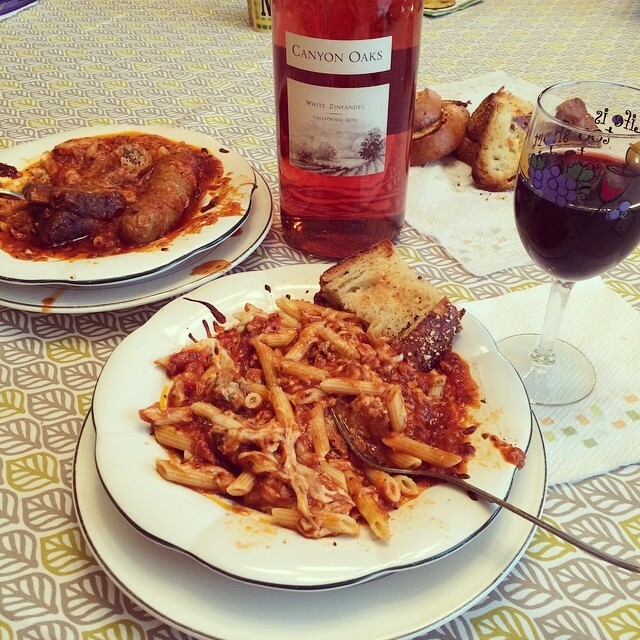 My favorite Italian dish is baked ziti and above is the first time I had ever tried Mr. Ralph’s sauce. He made baked ziti specifically for me because he knew it was my favorite. It is still my favorite meal to this day and no one has come close to making it as good as his. 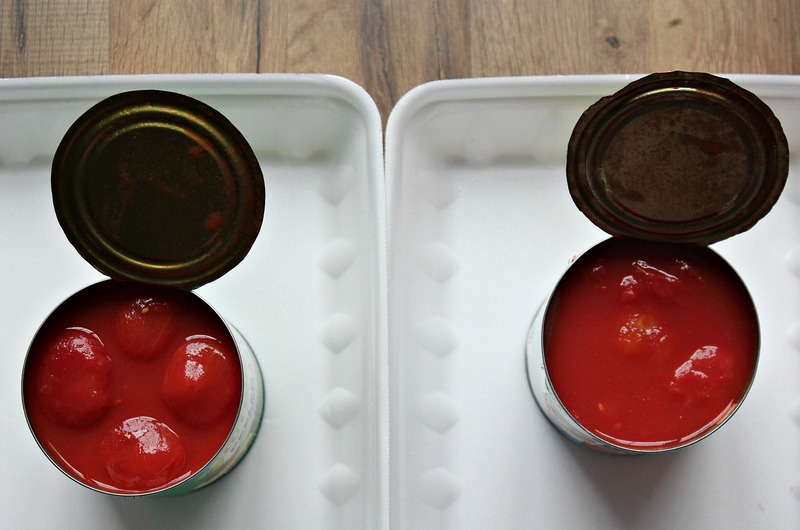 It was time to put the winning tomatoes to the ultimate test, the sauce test! Making sauce used to be such an intimidating thing to me, and now I’m just disappointed that I didn’t start making it sooner. I wasted so many years using the store-bought sauce. 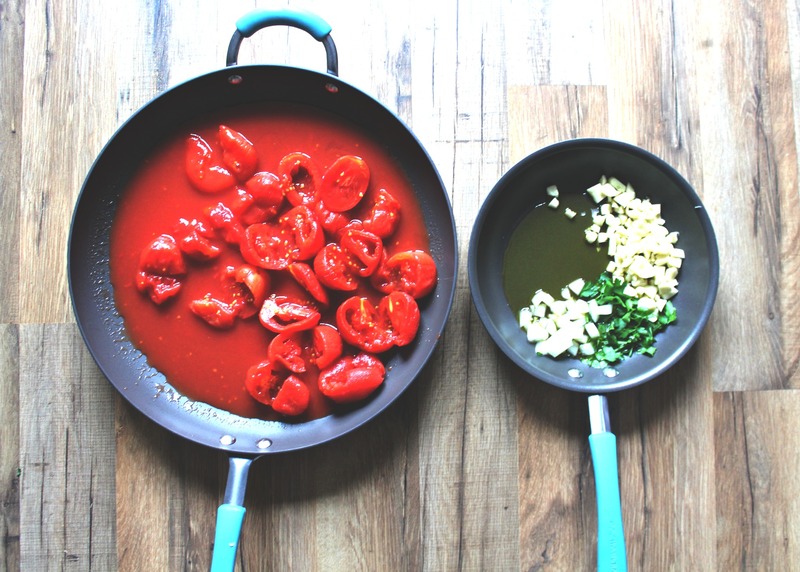 Making your own sauce is so much cheaper and healthier. I was pretty nervous to have my friend try my sauce because he grew up in a big Italian family where they take their sauce pretty seriously. His dad’s sauce is the best and blows every other sauce I’ve had out of the water. Funny enough, he only uses Tuttorosso tomatoes and has for years. 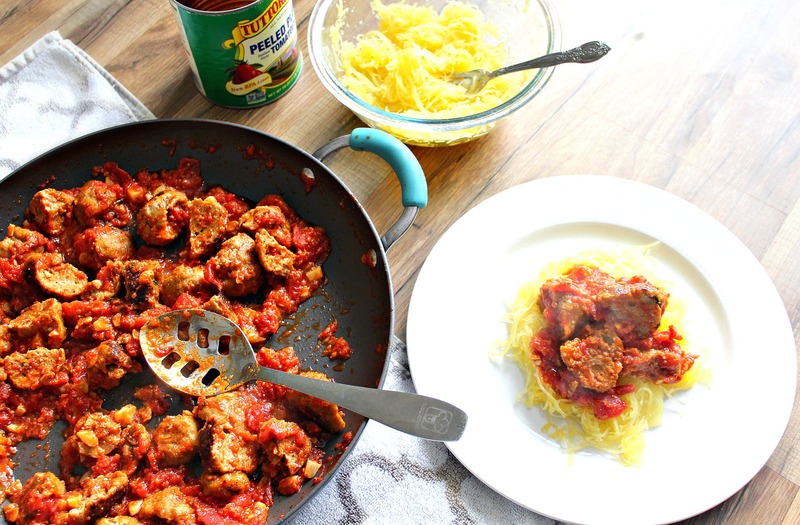 To keep the meal healthy, I decided to use spaghetti squash and make turkey meatballs for the sauce. This is the perfect weeknight meal. It would go well paired with a tossed arugula salad in a garlic balsamic vinaigrette. 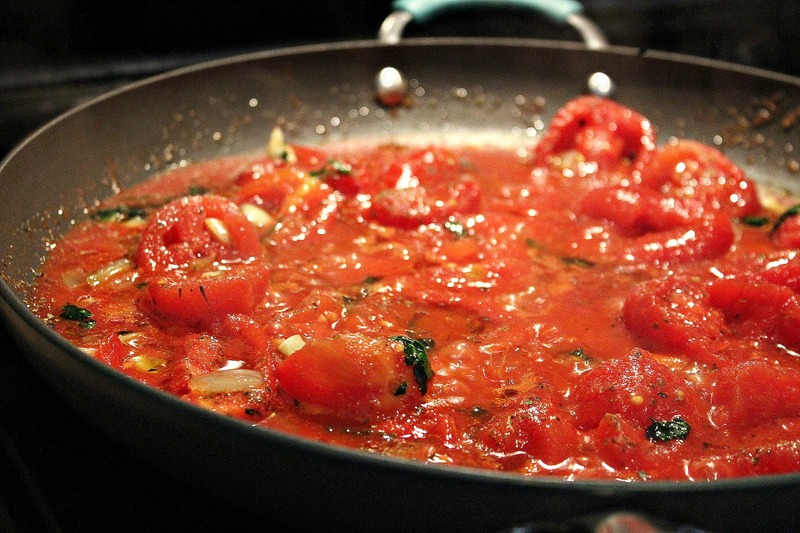 This is a very basic garlic tomato sauce recipe. You can customize it any way you’d like! Get fancy by adding all kinds of different vegetables or spices. 1. Add a tablespoon of olive oil to a large pan on medium-high heat. Add garlic powder, Italian seasoning, sea salt, and pepper. Give the tomatoes and seasoning a good stir and let them cook. 2. 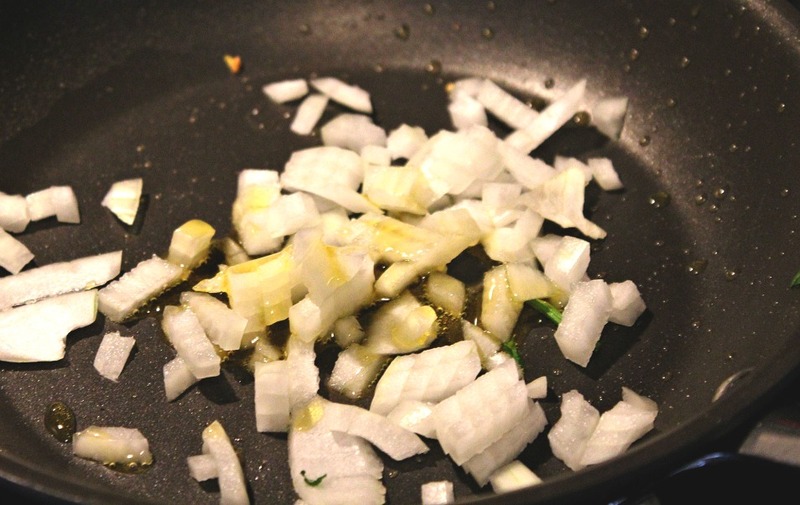 Add the remaining olive oil to a smaller pan with the onion, Italian parsley, and chopped garlic. Cook on high heat until the garlic and onions are lightly brown. 3. 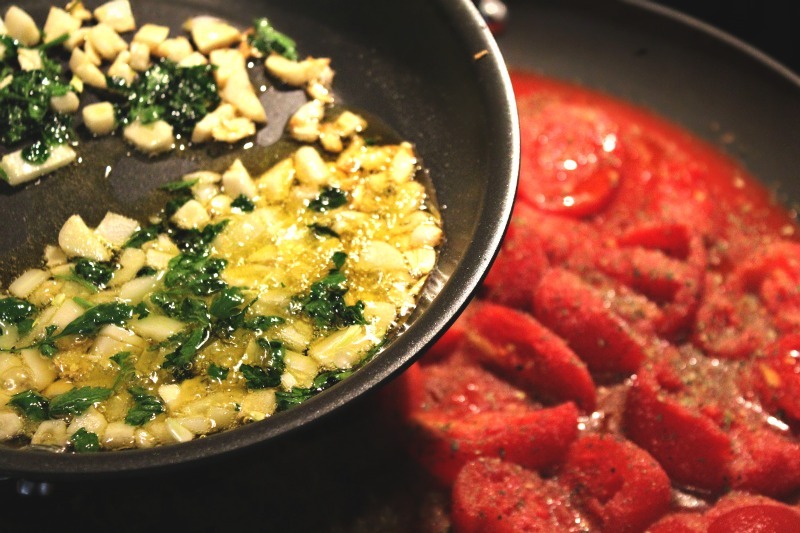 Add garlic infused olive oil to the pan with the tomatoes. 4. Give the sauce a good mix and let it cook on high. 5. Once the sauce starts to simmer, turn the heat to low and cover. Occasional stir every 5 minutes. 6. 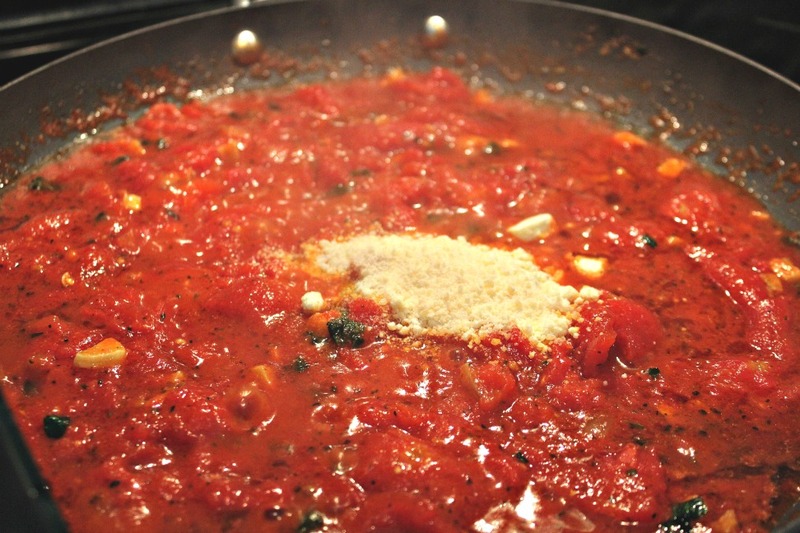 After the sauce has been cooking for about thirty minutes, break up the large chunks of tomatoes. Add the parmesan cheese and sugar to the sauce and stir. Try the sauce and make sure it’s just right! Maybe it needs more garlic, sugar, or salt! You decide. 1.Add Parmesan, fresh Italian parsley, ground turkey egg, bread crumbs, pepper, and salt to a mixing bowl. 2. Saute onions in a pan with a sprinkle of olive oil. 3. Add onions to the mixing owl and combine all the ingredients. 4. 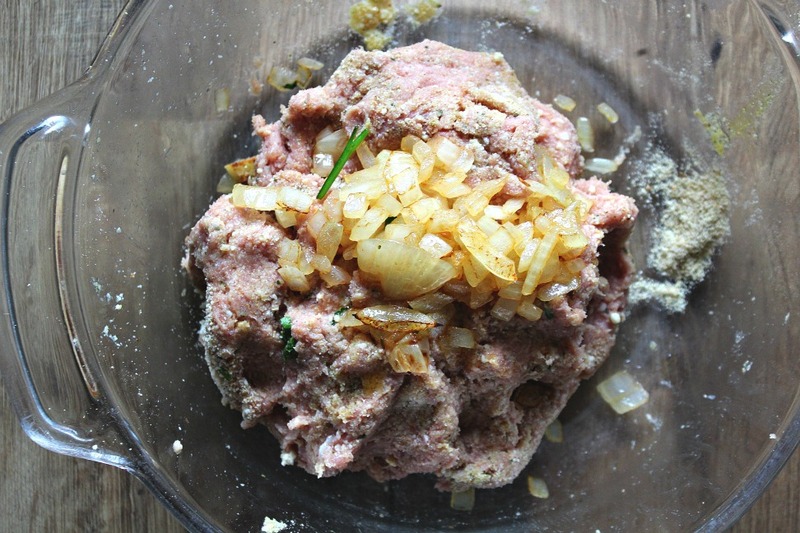 Form the mixture into giant meatballs. Each meatball equals about four tablespoons. 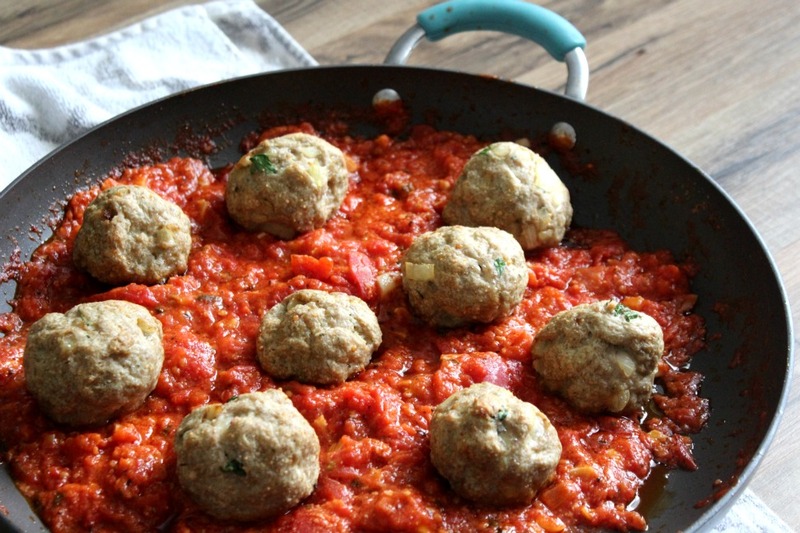 Place the meatballs on a baking sheet and cook for 25-30 minutes at 350 degrees. The outsides of the meatballs will be slightly brown. I always cut one open to make sure the centers are fully cooked. 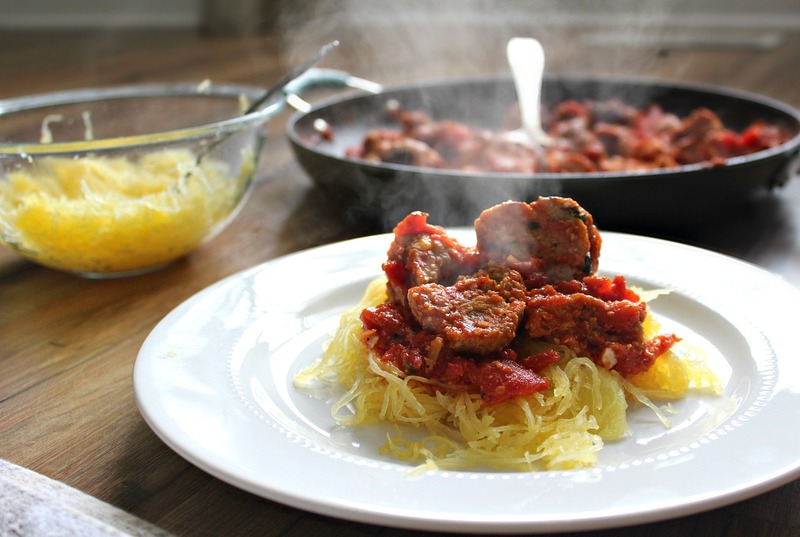 You can cook the spaghetti squash in the oven or in the microwave. I took the faster route. I sliced the squash in half, scooped out the seeds and microwaved the squash for ten minutes. I took a fork and scooped the squash into a bowl. 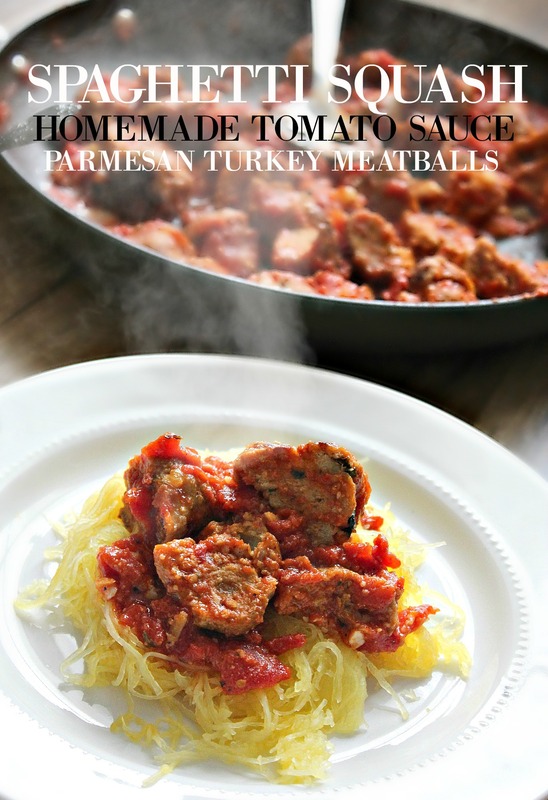 You can serve the meatballs individually or slice them up and cover them in sauce. The sauce made the house smell so good. All the hungry tummy’s were hovering over. 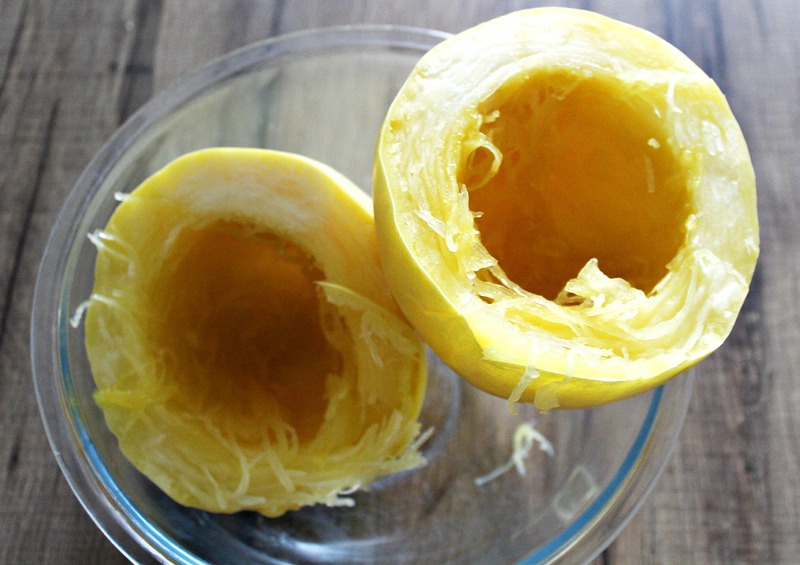 If you do not like squash, no worries! You can use any type of pasta. Add a tablespoon of olive oil to a large pan on medium-high heat. Add garlic powder, Italian seasoning, sea salt, and pepper. Give the tomatoes and seasoning a good stir and let them cook. 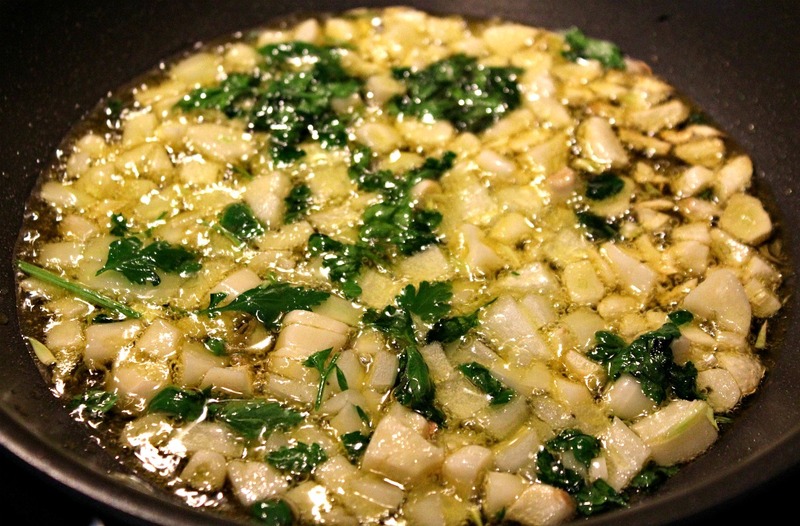 Add the remaining olive oil to a smaller pan with the onion, Italian parsley, and chopped garlic. Cook on high heat until the garlic and onions are lightly brown. 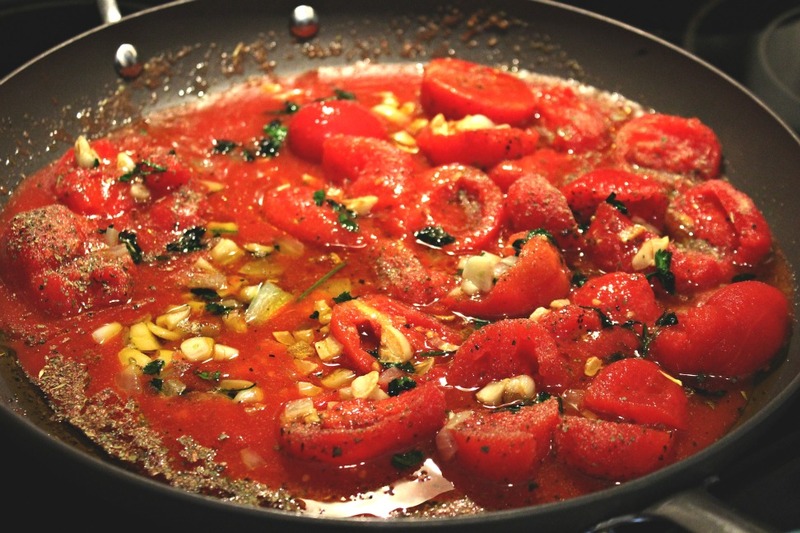 Add garlic infused olive oil to the pan with the tomatoes. Give the sauce a good mix and let it cook on high. Once the sauce starts to simmer, turn the heat to low and cover. Occasional stir every 5 minutes. After the sauce has been cooking for about thirty minutes, break up the large chunks of tomatoes. Add the parmesan cheese to the sauce and stir. Try the sauce and make sure it’s just right! Maybe it needs more garlic, sugar, or salt! You decide. Add Parmesan, fresh Italian parsley, ground turkey egg, bread crumbs, pepper, and salt to a mixing bowl. Saute onions in a pan with a sprinkle of olive oil. Add onions to the mixing owl and combine all the ingredients. 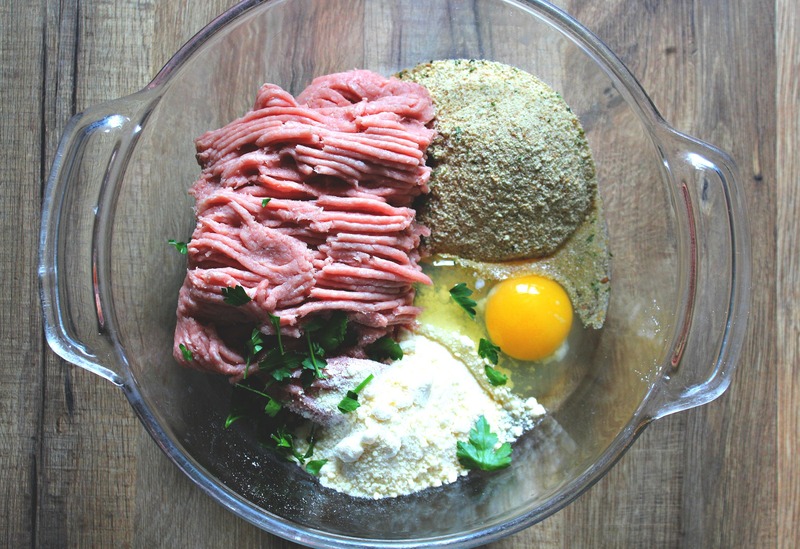 Form the mixture into giant meatballs. Each meatball equals about four tablespoons. 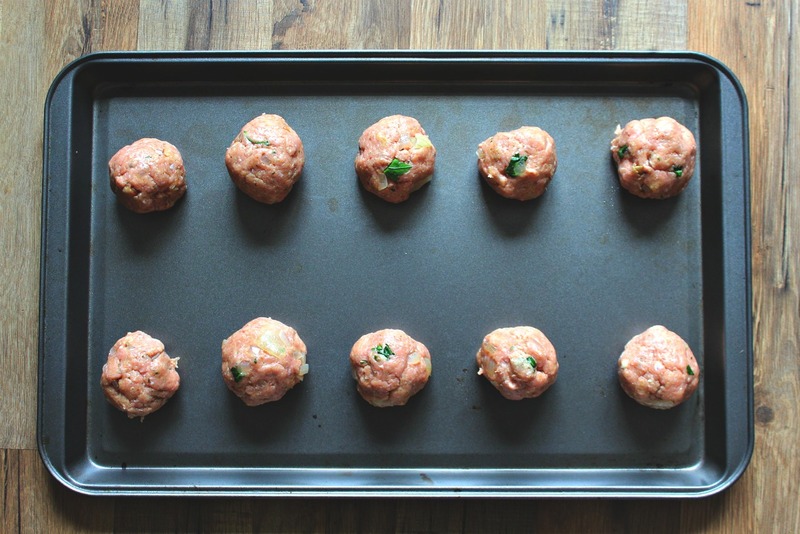 Place the meatballs on a baking sheet and cook for 25-30 minutes at 350 degrees. The outsides of the meatballs will be slightly brown. I always cut one open to make sure the centers are fully cooked. This was a huge hit. I was so nervous for my friend to try the sauce, but he said it was his second favorite (right below his dad’s) sauce! That was a huge compliment. He already has me making it on Tuesday night for all of his friends. This meal was so fresh, healthy, and filling. I’m so excited to make this sauce again with a seafood filled ravioli! I want to hear all about your sauce skills! 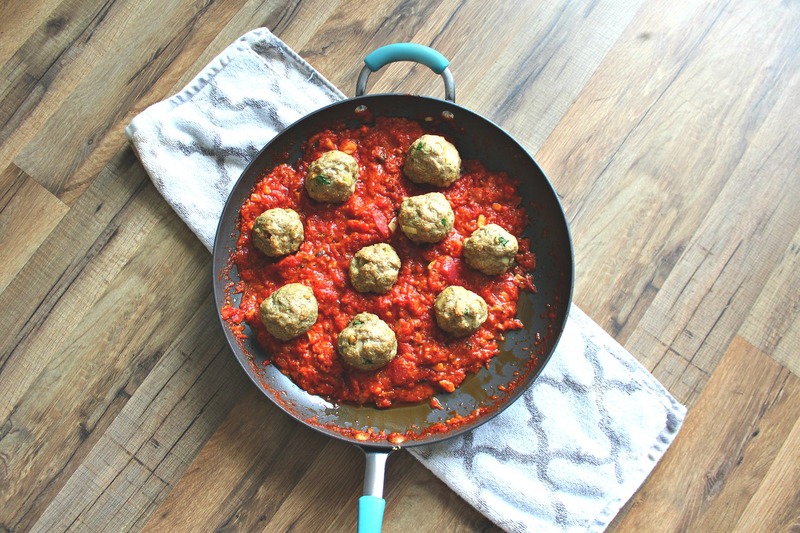 Have you ever made homemade sauce before? Who makes your favorite sauce? Wow this looks incredible! Can’t wait to try this recipe 🙂 Might try the sauce over some spiralized zucchini noodles too! I would love to do that as well! i havnt used my spiraler yet! This is the best sauce! Made this tonight (minus meatballs) and it was delicious!! Thank you for the sauce recipe. However, I couldn’t find the Tutorossa tomatoes at either of the grocery stores I looked at. I bought the Meijer organic brand. This meal was a hit! You should be able to find Red Gold, same company. Yum! I was just thinking that I wanted to make my own sauce because im always buying the canned sauces! Looks so great! You’d love it! I literally cannot stop making it! Where would I find Tuttorossa tomatoes at? I live in Nebraska and have looked several places. The meal looks amazing!!! At the grocery store in the canned section! Usually at the bottom of the shelves. I’m making this tonight for my boyfriend and I! This is the first time I’m making homemade sauce instead of store bought. So excited to see how it tastes!! wooo hooo! enjoy!!! :) Let me know what you think! This was such a great post! I had no idea tomatoes in a can could be so different. This sauce looks so delicious! 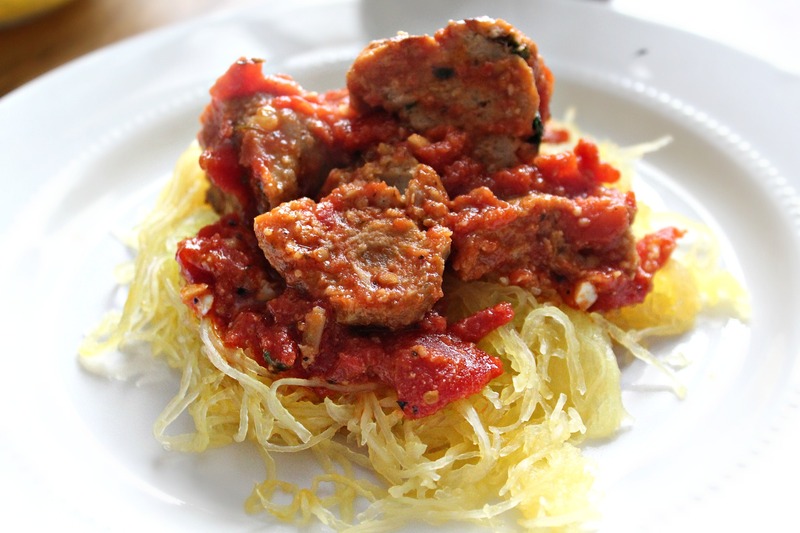 I love how you used spaghetti squash to! that is my favorite way of eating any good tomato sauce! Thank you for amazing post again! I had no idea either! Love learning about different foods 🙂 I hope you enjoy the sauce!! I’m making it again tonight! 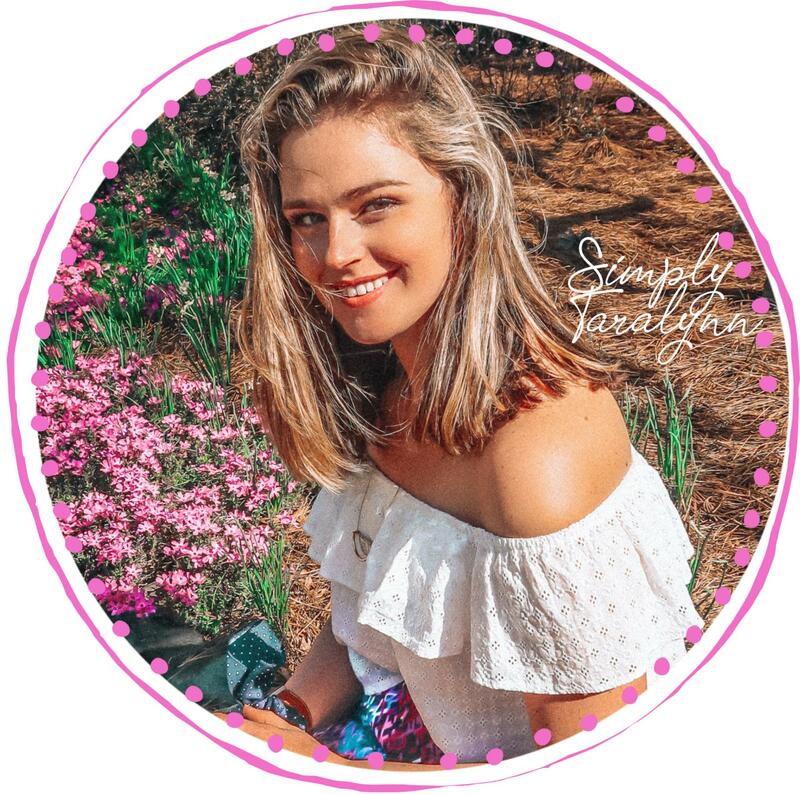 I like your pictures/graphics! Your blog photography is definitely improving. The only comparison point I think is somewhat irrelevant is the uniformity of the shape/size of tomatoes. Real food is never unform or perfect; I’m sure you’ve had heirloom tomatoes before – they are ugly as hell, but always taste so much better than the pale, mealy tomatoes most stores/restaurants carry. I’m sure the brand gave you this as an evaluation point in their challenge, but just wanted to point it out to consider. Also – genuine question, why would the “integrity” of the tomatoes (so whether they are crushed or not) matter? I’m just curious, because when I plan to use them in a recipe, they all get cooked down or mushed up anyway. It’s neat that they come in one piece, so maybe it has to do with a different processing method, but I was just curious. The integrity and uniformity show that Tuttorosso goes the extra mile in quality. All we make are tomato products and we take our quality very serious. We simply want to give you the very best tomatoes! If you can’t find Tuttorosso, they also make Redpack and Red Gold brands. That is so great to hear!! 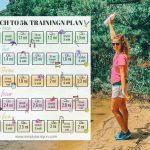 I have made it five times since this post! :) try the meatballs and sauce in lasagna! One of my favourite sauces is my own version of a pizzaiola. I fry garlic, onions and fres herbs (basil, rosemary, thyme) in some good evoo, add fresh peeled tomatoes, capers and real black olives (not the dyied green ones). I let it simmer for as long as possible, put it i a blender and add some fresh herbs, capers and olives for serving. I also love my dad´s homemade bbq sauce. So many ingredients, so much time cooking it, but the best thing ever! Wow that all sounds amazing!! I need to come over to your house for dinner! 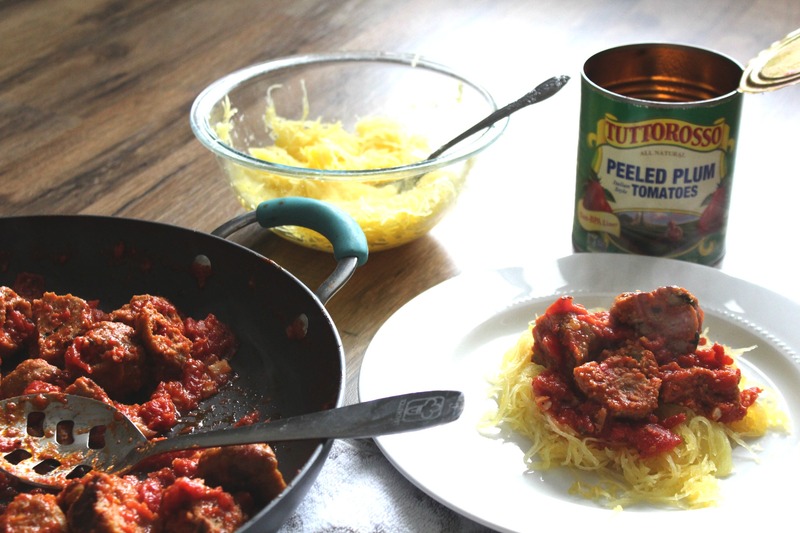 Tuttorosso tomato products are NON GMO Project Verified, Non-BPA/BPS, No Artificial Colors, Flavors or Preservatives, Certified Kosher, Vegan, Gluten Free, Cholesterol & Fat Free, Allergen Free, Made in the USA, Grown Sustainably on Family Farms and 100% Delicious! 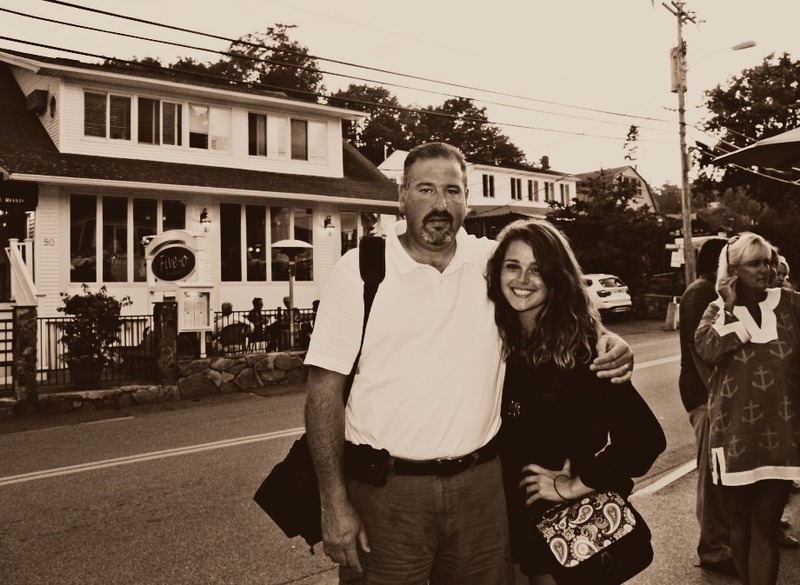 Tuttorosso, a 4th generation family owned company! They use BPA free liners. This looks SO delish, I can’t wait to try out the recipe!!!! I have made my own sauce before, but it was pretty basic. Yours looks amazing! 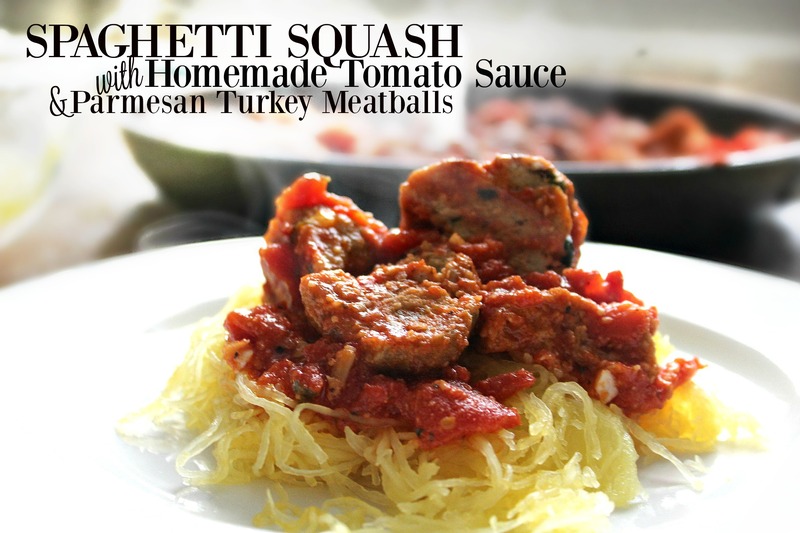 I can’t wait to try it and the turkey meatballs! Me too! & thank you!! Yum! I need to remember that brand next time I make sauce! My granny is full Italian and taught me her sauce recipe one summer, I love making it and can never seem to get enough of it! That sounds like so much fun! Lucky you!! Woah! You can really tell the difference in quality between the Tuttorosso tomatoes and the Hunt’s tomatoes. Crazy! I will be on the lookout for these. And they are cheaper! Crazy difference. Spaghetti has been my favourite food for as long as I can remember, so I’ve been making home made sauce for years! The recipe is my grandmothers, but I’ve made my own small changes to suit it better to my and my boyfriend’s tastes. Although my sauce pot (yes I have a specific pot for sauces haha) has finally kicked the bucket, so I need to go buy a new one! It’s always fun to add your own special twist to a sauce! I couldn’t believe the difference either which makes me think about all the other brands! & Tuttorosso is cheaper! Do you use one entire bulb of garlic or just one clove? Thank you! This looks delicious! And your photography is beautiful! I love the natural lighting. I have made many, many types of sauce. I’m actually trying a new recipe in the slow cooker tomorrow or Thursday. the best sauce I’ve ever had was at a now defunct Italian restaurant. the other was made by my ex-boyfriend’s mom. I should probably find a suitable sauce that I can actually eat again. heh. Slow cooker sauce is great! Lasagna is great and I have a yummy recipe for it coming up! Baked ziti is one of my favorite Italian dishes as well! 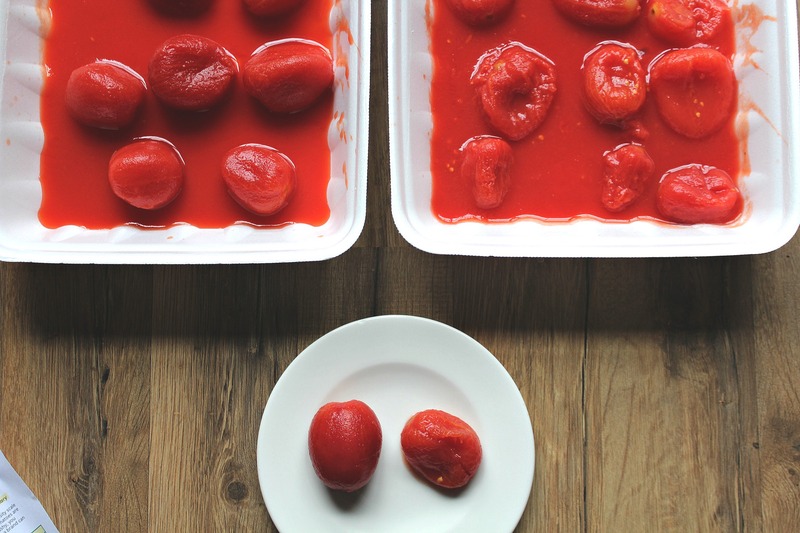 Also, I loved reading about the difference between Hunts tomatoes and Tuttorosso tomatoes- I would love to see more brand comparisons in the future! Hey Tara! Like your boyfriend, my family takes our sauce pretty seriously! I have made my own but it’s usually my dads job, his is the best. 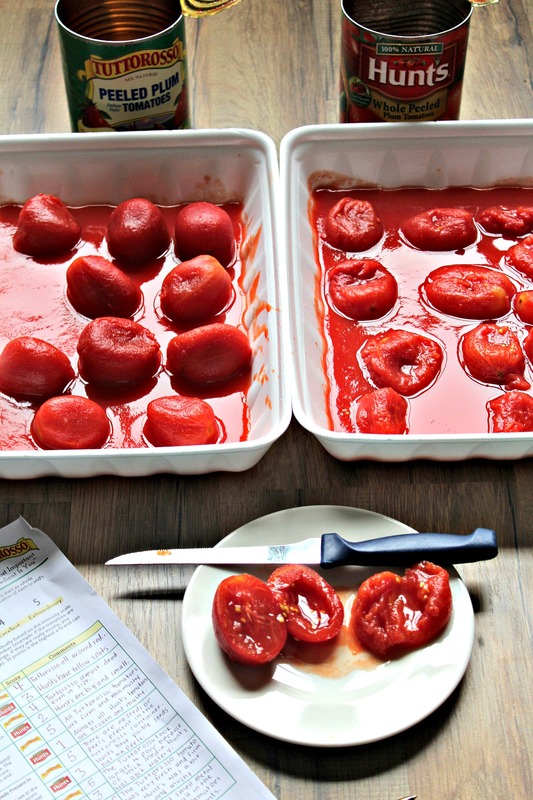 We have a tradition every summer where we buy crates of fresh tomatoes and jar them for sauce. Its a really fun day. We’ve been eating chickpea pasta lately, a brand called Banza. Have you ever tried chickpea pasta? 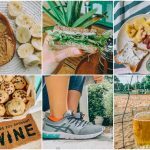 I would definitely get excited to read a post from you comparing different types of “healthier” pasta! Its definitely not the same as the real thing but it packs a lot of protein. I’ve never heard of chickpea pasta but now I’m intrigued!! Is it dry at all/bitter? Your family sounds like a blast! It isn’t really dry or bitter, the texture is just a bit off from regular pasta. I would say it’s grainy maybe? If you make a dish with lots of other textures like chicken or veggies you won’t notice it as much, but if its plain with a bowl of sauce you notice it more. It not bad though, just different! Ok im excited to try then!!! I’ve never mad emy own homemade sauce, but my mom makes incredible sauce. Her pizza sauce is to die for too. Since I got married and moved out, I am missing her spaghetti sauce and pizza sauce so much! I need to set aside a day and make it in bulk so I have it on hand! 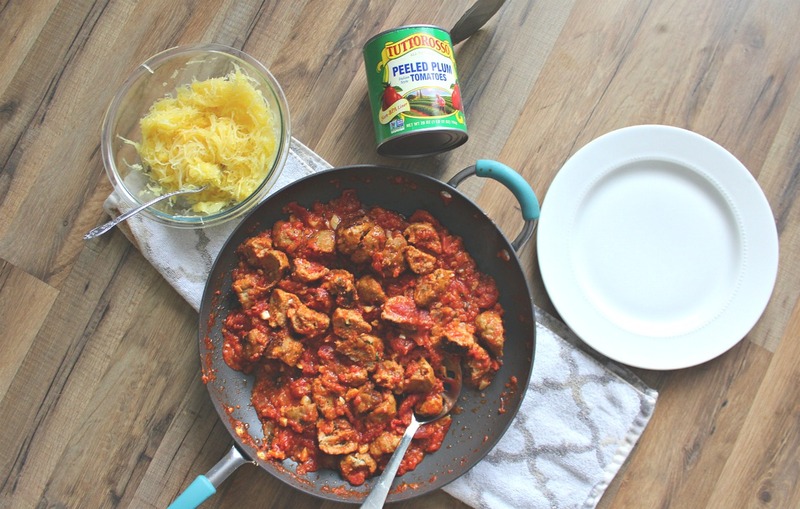 I’m not sure if I could pick one favorite Italian dish, but my mom’s homemade pizza and fettuccine Alfredo are definitely two of my favorites! It’s so funny that you posted this today because I just had a conversation with my dad about making sauce for the first time this weekend! Recently my boyfriend and I have been going through a lot of canned tomato sauce so I decided to check out the nutrition facts and ingredients and yikes! The list of ingredients is scary! Like you mentioned, I find making my own sauce intimidating. I don’t actually like tomatoes, so I have no idea which ones to buy and how to know if they’re good. Thanks to your post I now know where to start and I’m officially motivated to try to make my own sauce! I’m going to start with canned tomatoes now, and this summer when fresh tomatoes are in season I want to try using fresh tomatoes. Thanks for the inspiration! Once you make your own sauce, you’ll NEVER go back! I only use homemade sauce- the parmesan is definitely key! I have also been using Tuttorosso for years and hunts is plain disgusting! Your sauce looks amazing.